Sew N Ink: Big Top! One of my favourite parts of SU events is doing our Make n Takes- after all the demo's and inspiration, one is much looking forward to playing with the products. Though I'll be honest and say that the stamp set for this years regional was as far removed of being my taste as you could ever get, however I can see its potential. We saw wonderful water-colouring ideas and how to's from Julia Quinn in her WOW presentation, I am convinced that 'water-colouring' best results are best done on 'water-colour' paper, for me anyways. Perhaps it is that I need a lot more practise yet at it on normal cardstock, because my colouring in still looks pretty 'child like'. Julie sure makes it look easy and I love what she achieves with the crayons, aqua pens or blender pens. So more practise for me yet, and the fun is in developing your skills hey! By the time you read this post all 7 of SU Regional workshops will have taken place in Australia (and NZ) and we are free to upload our Make and Takes without spoiling any surprises for other state's Regional Attendees. Already I'm inspired by what other demos have achieved making the same projects with different colour combinations. In the meantime here are the Make n Take kits I have completed. This is probably my fav of the Regional M n T's. I can plenty of potential projects that could be made from the concept of this construction. -"I'm Not A Lion Circus box" I didn't like my lion's mane after it was coloured in so I punched out a circle, scalloped the edges and distressed them a bit with my fingers, popped it up and I like the effect - a different creative direction as we often have said in the scrapbooking world rather than a 'mistake' LOL! 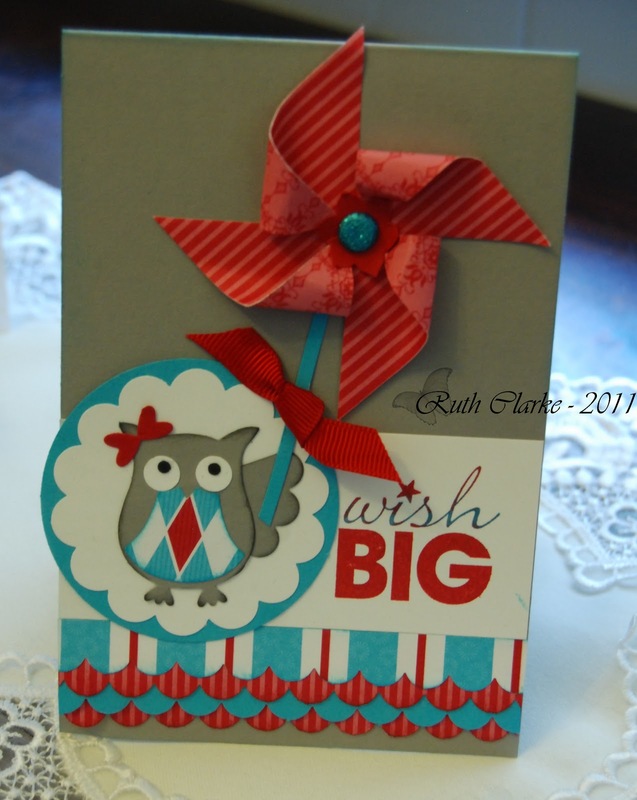 It carts 4 little mini cards- I love the bottom label effect- something new to try! Another good idea of using the embossing folder- and having the spots reverse side and right side on the flags. I can appreciate the design of this card-"Thinking Of You" and in no way meant to be disrespect to the designer but I didn't like the colour combo, so it made it a little hard to get into it. Here's the collection as well as a new card I've made for my 1st Team meeting. This card is a CASE from the lovely Kirsty Brown. I've made the card using new papers from DSP- Big Top Birthday and the red paper is from the BRIGHTS paper stack. Love the colour combo- Tempting Turquoise and Real Red. My objective of this card too was doing Pin Wheels. Stay tuned for some more projects featuring them! Okay so what else did we see at Regional's? Here are some of the gorgeous projects made by staff for their various Presentations. Australian Manager-Aaron Scott's collection of impressively constructed 'pop up' cards- props for his business discussions. Great dry embossing effects achieved with the Impression Folders on Chipboard and Balsa Wood! Lovely ideas again using the Bigz die- Beautiful Butterflies and with this project- DSP Morning Mocha- This group of designer papers also features beautiful flocked designs. Embossed Favour box with clear windows and little folded tags from NEW Bigz Two Tags die. Love this shabby chic project - butterflies cut from the DSP- Flirtatious papers also featuring the Delicate Dollies stamp. One of the lovely staff members - Clare Martin gave an extensive presentation of the various forms and effects one can accomplish using the STAMPING WHEELS. 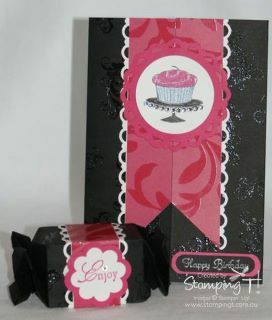 Create beautiful cards, patterned backgrounds and your own gift wrap papers. Well once again a photo- laden post, but that wraps up the my Regional experience, hope you enjoyed the share.